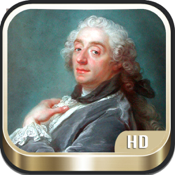 ✓ This app is a virtual gallery with complete collection of HD artworks (drawings & paintings) by Boucher. ✓ Get this app for free, check out more artist apps by MOKOO! ★ the largest collection of Boucher's work on the App Store, browse through the collection of HD artworks without internet/wifi/3G connection. ✰ François Boucher was a French painter, a proponent of Rococo taste, known for his idyllic and voluptuous paintings on classical themes, decorative allegories representing the arts or pastoral occupations, intended as a sort of two-dimensional furniture. He also painted several portraits of his illustrious patroness, Madame de Pompadour.